In between all of the statistical activities and numerical outputs, the data collected at any given time has a story to tell. One of the universal storytelling methods for all of humankind is communication via pictures — indeed, inscribing images of things into clay tablets or on cave walls (e.g., the Lascaux wall paintings) were our initial attempts at conveying something important to others (or ourselves). This seemingly innate characteristic of observing what’s going on around us and then creating an image to relate our observation is still in full force today: memes, endless cat and dog pictures floating through social media timelines, training AI to recognize pictures (yes, cat pictures too), infographics, etc. Thus, as a data scientist, you will also carry on this tradition, not just for others but also throughout the various data science macro and micro cycles. Why Tableau for Data Visualization? Python, R, and Excel all provide data visualization tools, so why use Tableau instead? First and foremost, employers may prefer Tableau as their go-to data visualization software for their departmental analysts. Unlike Python and R, there is no need for users to have knowledge of a programming language for creating data visualizations and analyses in Tableau. Real-time reporting and advanced predictive analysis are crucial for the 21st Century enterprise — all businesses, whether big or small, are digital entities. Data flows in from a variety of digital sources both internally and externally. As such, any data visualization tool must allow for swift importing of different data sources whether or not the analyst (or other stakeholder) has the background knowledge to do so using a programming language. 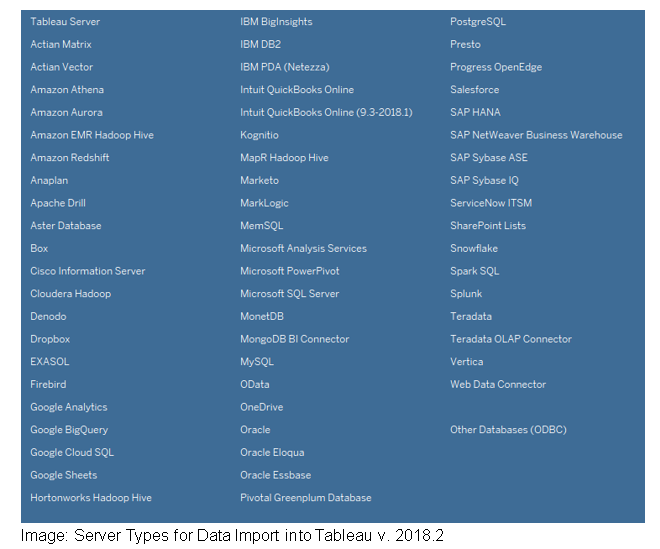 Tableau allows data importing directly into Tableau from over 50 different server sources. Users can also query data using SQL and perform statistical analytics within Tableau. Certainly, those with advanced knowledge and experience in R, Python, and Excel can perform similar functions, but Tableau has a more democratic approach: any user can quickly and easily generate basic, intermediate or advanced data visualizations and apply statistical analyses to the data. At a basic level, Tableau is a quick way to generate simple charts and graphs. However, the advanced features such as cohort segmentation, what-if analyses, and forecasting expand Tableau’s use cases beyond merely creating histograms and pie charts. For those data scientists who prefer Python or R, Tableau has incorporated an integration for both of these popular data science programming languages. Users can build advanced analytics using either of the two in conjunction with the Jupyter notebook or via the Tableau server. Summarily, Tableau is a powerful business intelligence (BI) tool that continues to assimilate the growing assortment of data import sources and analytics capabilities (machine learning, deep learning, Artificial Intelligence, etc.). Given Tableau’s popularity and perpetual evolution as the one stop shop for all things data visualization and analysis, there are learning paths and certifications available for all learner types. Whether you are a beginner or a full-fledged Tableau dashboard developer, a Tableau certification is an excellent way for you to demonstrate your knowledge, skills, and abilities clearly. Coursera: The University of California, Davis offers a Data Visualization with Tableau Specialization for $49 per month. Learners will complete a five-course series, each lasting approximately 4 weeks, and begins with Fundamentals of Visualization with Tableau. Subsequent courses include Essential Principles for Tableau, Visual Analytics with Tableau, Creating Dashboards and Storytelling with Tableau, and Data Visualization with Tableau Project (the capstone project for the specialization). At the successful completion of each course, learners will receive a certificate to showcase on their LinkedIn profiles or to send to potential employers (note: it’s best if you send these upon request from an interested employer — or direct them to your LinkedIn profile). You can take each course individually without earning the entire specialization certificate, and Coursera allows learners to apply for financial aid, where, upon approval, the entire specialization will be cost-free. Udemy: When it comes to data science and analytics education, there are very few topics of study that Udemy instructors haven’t created. This holds true for Tableau learning paths which range from Hands-On Tableau Training for Data Science and beginning tutorials such as Tableau Desktop — Super Easy Introduction. Pricing for each tutorial is, on average, between $12 and $13 per course, making Udemy one of the most affordable choices for quick on ramping into the world of Tableau. Tableau.com: If you want to be certified by Tableau (directly) as either a Qualified Associate or Certified Professional, Tableau offers two certification types: Desktop and Server. However, regardless of whether you choose the Desktop or Server certification path, you will first need to pass the Qualified Associate (QA) exam — which is $250. Advanced Tableau users who have already passed the QA exam can opt to take the Certified Professional exam for $600. There is a general exam prep guide provided along with sample solutions. For those who are just beginning with Tableau, there are free training videos available at the Tableau training website. But, Tableau also offers online training for $400 (as of this writing). While the cost is undoubtedly far steeper than Coursera or Udemy, the upside is you’ll receive training that aligns explicitly with the exam.